We are one of Australia's leading providers of disability services. We are dedicated to human rights and to ensuring individuals with a disability have greater choice, control, and freedom over their lives; helping to create a more independent life for people, now and in the future. An exciting, new fulltime opportunity has become available. Reporting to the Health, Safety and Wellbeing Manager, the Health, Safety and Wellbeing Advisor provides practical Work Health and Safety (WHS/OHS) support and advice to House with No Steps (HWNS) Managers and staff across a range of services. 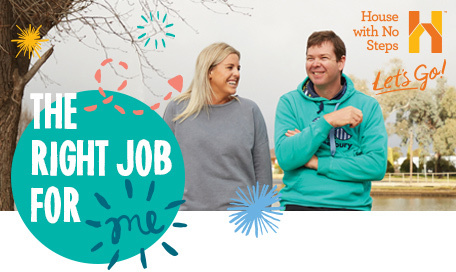 With a focus on HWNS services in the North and West of Melbourne and Regional Victoria this role includes a flexible working location and is to be based at either our Ballarat or Preston offices. The role is responsible for promoting and increasing knowledge, understanding, commitment and compliance with relevant HWNS Policies, Procedures and WHS legislative obligations. Well-developed computer skills - MS Word, MS Excel, Power Point; including the capacity to learn new systems. Strong organisational skills, with demonstrated ability to work independently to organise and prioritise workload, handle multiple tasks and work efficiently and effectively to deadlines and respond to multiple and diverse stakeholders. Well-developed written and verbal communication skills; adaptable to the specific needs of individuals or groups - including liaison, negotiation and issue resolution. Understanding of the statutory and regulatory frameworks in which HWNS operates. An understanding of the National Disability Insurance Scheme and the National Standards for Disability Services. The Health, Safety and Wellbeing Advisor role is also required to travel, including occasional overnight trips, to office and service locations/workplaces. A company motor vehicle forms part of the remuneration package on offer. If you are interested in applying for the role of Health, Safety and Wellbeing Advisor, please email your resume and a brief covering letter outlining how you meet the above criteria and why you would like to be considered to Craig Ballingall, Health, Safety and Wellbeing Manager, CBallingall@hwns.com.au. Shortlisted applications will be required to undergo pre-employment and criminal history checks. House with No Steps is an Equal Opportunity Employer and promotes a workplace that actively seeks to include, welcome and value the unique contributions of all people. Including; people with disability, young and mature age candidates, Aboriginal and Torres Strait Islander people, and applicants from culturally diverse backgrounds. Successful applications will be subjected to Pre-Employment and Criminal History Checks.